Our new family favorite – decidedly kid-friendly. Use a knife to separate the skin from the salmon. Chop or pull into ¼ inch pieces. Put three quarters of the salmon into a large mixing bowl. 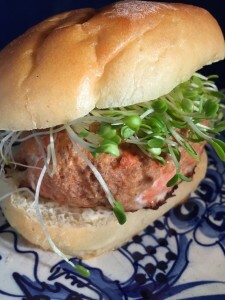 Put the rest of the salmon in a food processor (I use a small one and it is perfect). Put the mustard, mayonnaise, lemon juice, lemon zest, scallions and sea salt in the food processor and pulse to make a paste. Combine contents of the food processor with the salmon in the large bowl. Add ½ cup bread crumbs and egg and mix. Brush olive oil on baking sheet, cast iron or pyrex pan. Divide salmon mixture into four parts and pat into a 1 inch thick burger shape and put on oiled pan. Toss it in the oven. Bake on 400 for 15-20 minutes and the patties feel springy in the center. Prepare tartar sauce (or just use mayo and some pickles or lacto-fermented veggies). 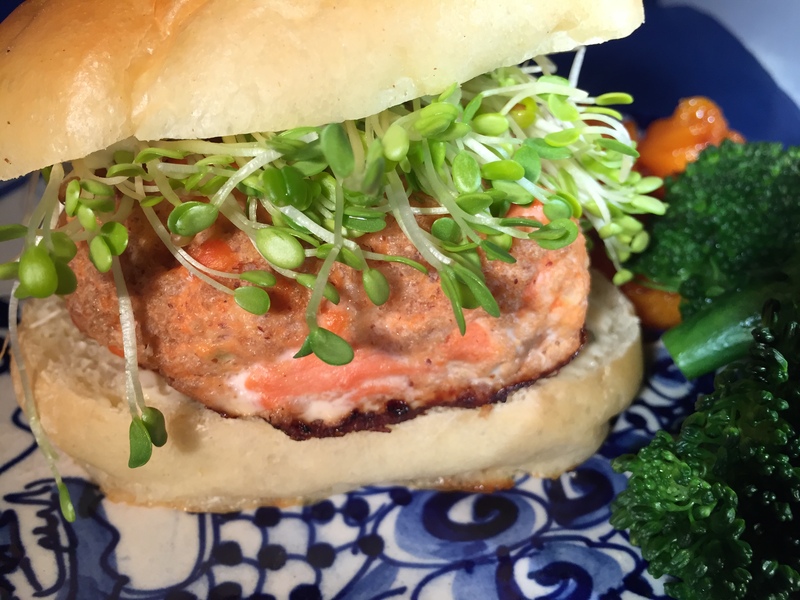 Assemble burgers – tartar sauce on bun, salmon burger, and topped with sprouts or greens. Let’s eat! This entry was posted in Main courses, Recipes and tagged kid-friendly, seafood. Bookmark the permalink. Both comments and trackbacks are currently closed.